It was long due and as we are very busy people (our social and professional lives take a huge part of our time), we couldn’t agree on a date to go for a little tour. Last week we couldn’t put it of any longer, and as the weather was unbelievable we took our road bikes and hit the road. Our plan was to manage to get to a green way (an old railway path that has been fixed for bikes), and from there see how long we get. But actually the way till there was easier than being on the green way, as it’s made for mountain bikes, or at least bikes with thick wheels, so in the first exit we decided to go back to Bilbao doing a quite big detour, through the nice basque landscape. 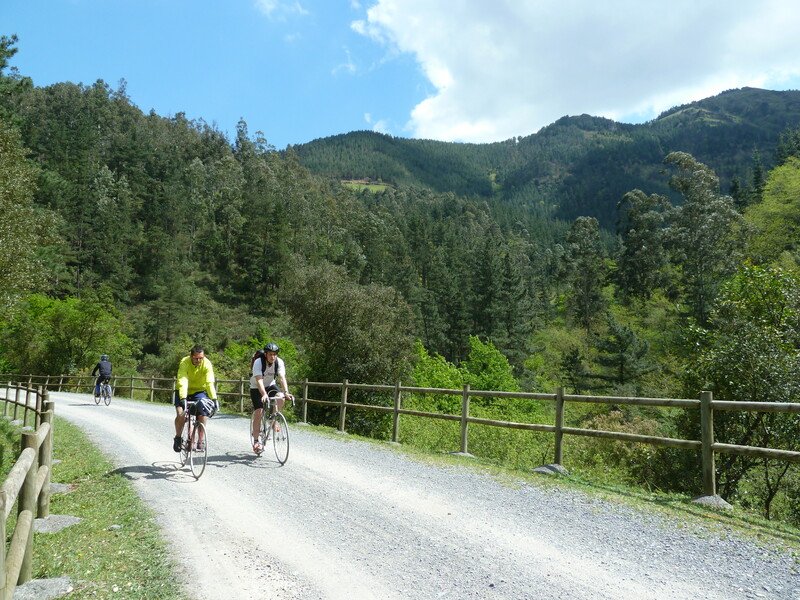 At the end we did 75 kilometers, we started in Portugalete and we went all the way till Muskiz and Balmaseda, to return to Portugalete next to the river. It was nice to be outside, because our meetings are always at some of our places, and rarely at some bar. So I really enjoyed having fresh air. We got half lost a couple times, but the way was not the important thing. We saw how we work together while riding, and we really have to practice a lot, as our physical condition is quite different. Javi, even though he does lots of sports, he is not used to riding a bike, and Goiznabar is very irregular (he can be complaining half an hour saying how he can’t and the next half an hour go so fast that is hard to follow him). On the moment we decided to return everything became much more relaxed, and we actually decided some important things about the trip, the web-page and the project (a secret so far, but you will see it soon enough). When we got back home we wanted to work a bit on the to do list, but we were so tired that we could not really pay attention to what the others were saying, so we decided to call it for the day. It was a nice day, and productive too, and even though we will need to practice together a lot more, it was a nice first time going the 3 of us, and I hope our trip is not much different.